REVIEW: George Ellenbogen, "A Stone in my Shoe: in Search of Neighbourhood"
REVIEW: Freda Johles Forman, ed. "The Exile Book of Yiddish Women Writers: An Anthology of Stories That Looks to the Past So We Might See the Future"
REVIEW: Myra Giberovitch, "Recovering from Genocidal Trauma: An Information and Practice Guide for Working with Holocaust Survivors"
REVIEW: Ira Robinson (ed. 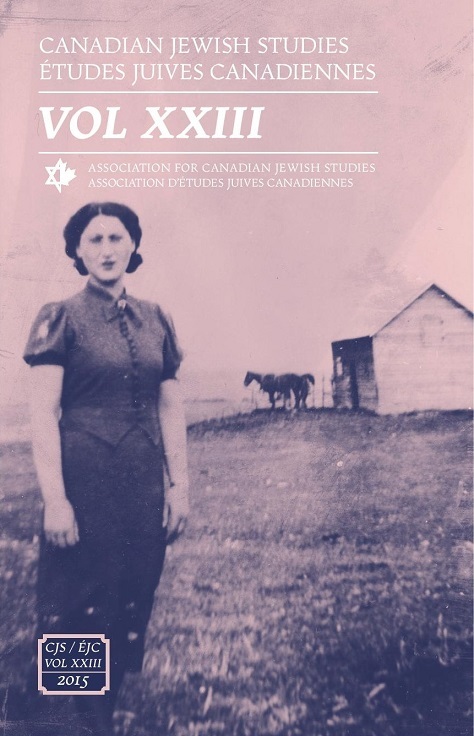 ), "Canada’s Jews in Time, Space, and Spirit"
REVIEW: A. Gabriel Sivan (ed. ), "The Jewish Emigrant from Britain, 1700-2000: Essays in Memory of Lloyd P. Gartner"
REVIEW: Asher Charles Small (ed. ), "Social Theory – A Historical Analysis of Canadian Socio-Cultural Policies, ‘Race’ and the ‘Other’: A Case Study of Social and Spatial Segregation in Montreal"
REVIEW: Miriam Waddington, "The Collected Poems of Miriam Waddington"
REVIEW: Shulamis Yelin, Gilah Yelin Hirsch, and Nancy Marrelli, "Demonic to Divine: The Double Life of Shulamis Yelin"